A range of energy storage technologies are available today. They are designed to save previously generated energy and deploy or use it at a later time. The predominant technology for energy storage employed by utilities and corporations is lithium-ion batteries. 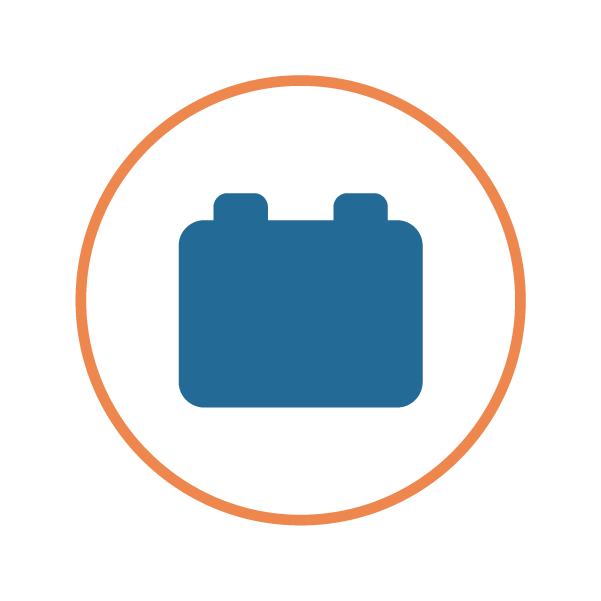 Battery and energy storage components are an important part of DER’s (Distributed Energy Resources) to build systems moving energy generation and storage closer to energy consumption. For our purposes here, we are using energy storage as it refers to lithium-ion battery technology. 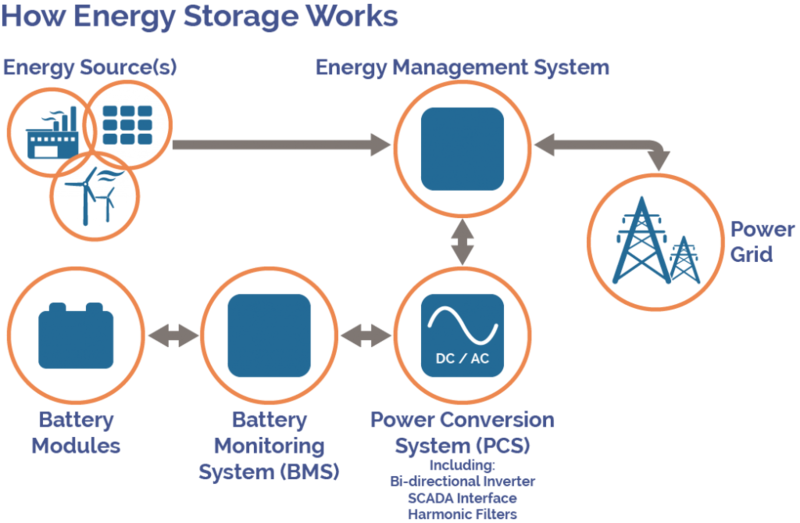 What are the components of an energy storage system? The Balance of System (BOS) including civil works, permitting, etc. 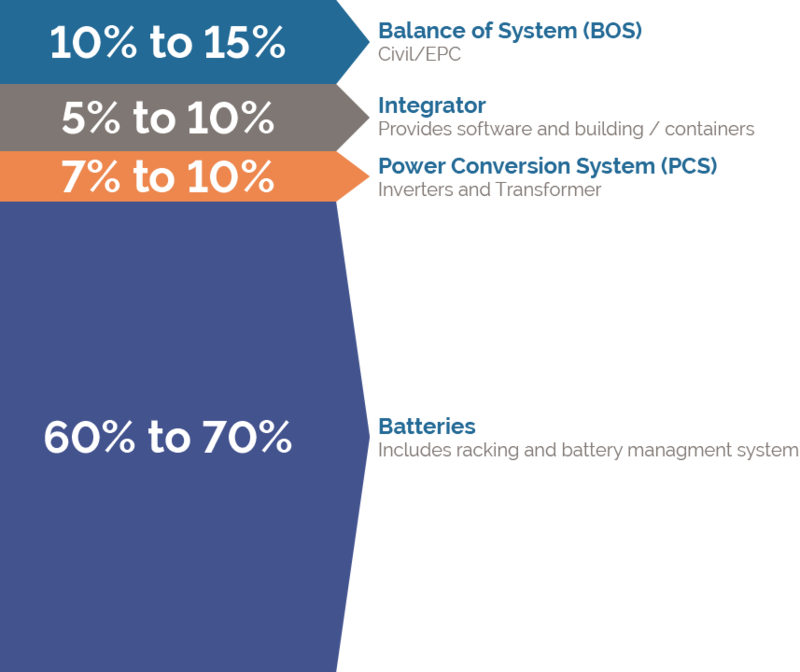 How do the costs typically breakdown for energy / battery storage systems? 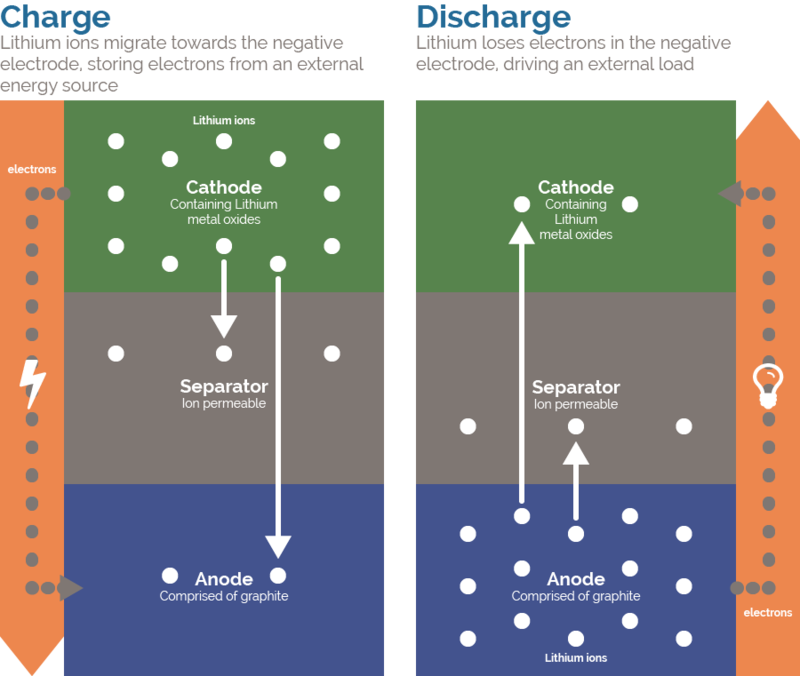 How does lithium-ion battery technology work? Lithium-ion or li-ion battery (abbreviated as LIB) batteries are found in many modern-day devices including smart phones. The price of LIB technology has fallen dramatically in the last few years as they are used in electronics, electric vehicles, industrial applications and on the electric grid. Lithium-ion batteries are rechargeable. When the battery is connected to a charger, the lithium ions move in the opposite direction as before. As they move from the cathode to the anode, the battery is restored for another use. Even in the case of large utility-scale installations, lithium-ion batteries are rechargeable. A typical use would be for renewable energy sources like wind and solar to charge the batteries for use at another time. Electricity discharged from the lithium-ion battery is converted from DC power to AC power via a bidirectional inverter. What is typical battery capacity? Battery capacity is generally communicated as stored energy in MWh. (Megawatt hours). 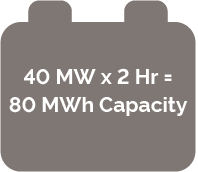 For example, a battery that could deliver 40 MW with 2 hour discharge would have capacity of 80 MWh. Alternatively, this same system could discharge approximately 80 MW in one hour. How does an energy storage project make a positive contribution to the environment? In the context of large utility-scale and corporate use, energy storage systems benefit the environment in a number of ways. By providing storage for renewably generated energy including wind and solar, batteries save clean energy and distribute it closer to the source of its use and at off peak times when renewable technology is not generating energy. Thus, the energy storage systems extend the positive environmental benefits of wind and solar. As the amount of renewable energy grows, battery storage is a crucial component to storing and distributing the energy to provide for a reliable grid. Energy storage systems also offset the need to build more fossil fuel systems like coal-fired power plants, nuclear or natural gas systems. Fossil fuel plants can take many hours to ramp up and deliver electricity to the grid. Energy storage/ battery systems respond quickly and when used to replace fossil fuel power plants, they cut CO2 emissions. The cost of energy storage systems is falling and represent a much smaller investment than large central generation power plants. They can be constructed much more quickly than traditional systems and reduce transmission costs as the energy is closer to the source of consumption. All of these attributes reduce construction costs, materials and impact on the environment. For example, a growing number of states see energy storage as a way to reduce carbon emissions and at the same time, electricity costs. Utility-scale and large corporate purchase of clean energy through power purchase agreements (PPAs) provide stable energy costs, renewable offsets and a host of other benefits to these offtakers. As the regulatory and policy environment expands support of energy storage systems for use by utility and corporate users, more systems will come online. When combined with solar, the systems represent a rapidly expanding opportunity for the investment community.